1.5 Marilyn Katz "Barack Obama could only have emerged in Chicago"
Barack Obama did not rise to prominence from a political vacuum. 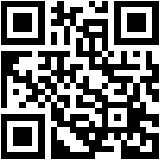 His political career has been supported since its earliest stages by a coalition of Chicago socialists. This alliance, centered around the Communist Party USA, Democratic Socialists of America and the far left of the Democratic Party came into its own in Chicago in the early 1980s. 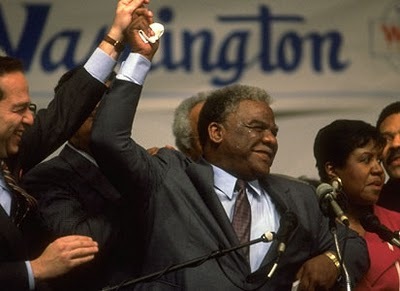 One of the alliance's major successes was the election of Chicago's first black Mayor, Harold Washington in 1983. A Democratic Party Congressman, Washington bravely and successfully ran for mayor against the remnants of the once invincible Daley machine. Washington died in office in 1987, but the alliance remained intact, incorporating the Communist Party spin-off Committees of Correspondence and went on to elect Carol Moseley Braun, to the U.S. Senate in 1992. The same alliance worked to elect Barack Obama, to Moseley Braun's former Senate seat in 2004. In 2008, they worked with their allies nationwide to help put Barack Obama into the White House. On February 25, 2008 the the Communist Party USA online journal Political Affairs published an article by Joel Wendland entitled "Harold Washington: The People’s Mayor". Another unquantifiable part of Washington’s legacy is his enduring influence on national politics. Just about everyone interviewed for this story eventually came around to talking about another emerging Chicagoan – Barack Obama. Perhaps it is no accident that he too talks in broad, hopeful terms about change, reform, and empowering the people to reclaim democracy. Elwood Flowers, former vice president of the Illinois AFL-CIO and was a close friend and political ally of Harold Washington. But the confidence he instilled in black leaders became a permanent factor in Chicago politics. His success inspired Jesse Jackson to run for president in 1984, which in turn inspired Obama...Washington also strengthened the community organizations in which Obama was cutting his teeth...Obama's Project Vote, which put him on the local political map, was a successor to the South Side voter registration drive that made Washington's election possible. Radical Chicago journalist Don Rose worked for Harold Washington, Carol Moseley Braun and mentored senior Obama adviser David Axelrod. According to Don Rose, Chicago has two unique advantages. First, it's in Cook County, which contains nearly half of Illinois' voters. Second, the local Democratic Party is a county wide organization. After Chicago's Carol Moseley Braun beat two white men to win the 1992 Democratic Senate primary, precinct captains in white Chicago neighborhoods and the suburbs whipped up votes for her in the general election. "They had to go out and sell the black person to demonstrate that the party was still open," says Rose, who sees "direct links" from Harold Washington to Carol Moseley Braun to Barack Obama. Marilyn Katz "Barack Obama could only have emerged in Chicago"
Marilyn Katz has worked closely with Barack Obama since meeting him through his position at Miner, Barnhill & Galland in the 1990s. In August 2008 Don Rose and Marilyn Katz gave an interview to the Democratic Socialists of America linked journal In These Times, just before Obama's "coronation" at the Democratic Party Convention in Denver. In August 1968, those explosive battles put Chicago at the epicenter of one of the most searing political and social upheavals of the 20th century. In August 2008, a U.S. senator from Chicago will be anointed the first black major-party nominee for the presidency of the United States. The 1983 election of Harold Washington as Chicago’s first black mayor came courtesy of a progressive coalition of blacks, Latinos and so-called “Lakefront liberals.” Katz and Rose were there, once again, as advisors and operatives. ITT The Democratic Party will gather once again later this month. Everybody is expecting a big party in Denver. Will it be an Obama coronation? Is that what we should be looking for? So how do you resolve Obama’s move to the center? What about holding his feet to the fire? Don’t we need to keep him true to progressive issues? Obama chief campaign strategist and senior adviser David Axelrod has also commented on the Harold Washington/ Obama connection. Twenty-one years later, when Barack ran for the U.S. Senate in the primary against six very strong candidates, he carried every ward on the northwest side except one...I was thinking, and I told Barack, that Harold Washington is smiling down on us." In 1999, Obama challenged Bobby Rush, who has represented the South Side in Congress since 1992. Rush had run against Daley in the 1999 mayoral primary, and Obama interpreted Rush’s defeat in that citywide race as a harbinger of his declining popularity in his congressional district. Carl Davidson, Marilyn Katz, James Weinstein, Don Rose and other Chicago area radicals came together as Chicagoans Against War in Iraq in September 2002 to campaign against the war in Iraq. 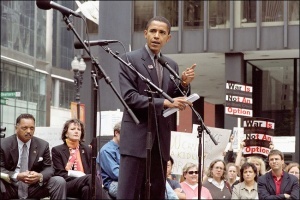 The group began by organizing the famous October 2, 2002 anti war rally in Federal Plaza Chicago that drew a politically significant line up of speakers, including U.S. Representatives and a candidate for U.S. Senate, Barack Obama. It was at this event where Barack Obama first made his name as a strong opponent of the war. Some of the people around Davidson, later held a fundraiser for Obama when he ran for U.S. Senate in 2004. According to Ryan Lizzathe idea for the rally came from Bettylu Saltzman and some friends, who, over Chinese food, had decided to stage the protest. Saltzman asked John Mearsheimer, a professor of political science at the University of Chicagoto speak, but he couldn’t make it. “He was one of the main people we wanted, but he was speaking at the University of Wisconsin that day,” Saltzman said. Then she called her rabbi and then Barack Obama. Michelle answered the phone and passed the message on to her husband, who was out of town. Saltzman also called Marilyn Katz, a leading member of Chicagoans Against War on Iraq Katz managed to get Jesse Jackson as a speaker and handled many of the organizing details. Katz described what she felt the political mood was at the time of the rally. “Professors are being turned in on college campuses, Bush’s ratings are eighty-seven per cent,” she said. In his biography of Obama, David Mendell, noting that Obama’s speech occurred a few months before the official declaration of his U.S. Senate candidacy, suggests that the decision to publicly oppose the war in Iraq was a calculated political move intended to win favor with Saltzman. While an Illinois State Senator, Barack Obama was a strong advocate of "single payer" health care-socialized medicine. I happen to be a proponent of single-payer universal healthcare coverage. I see no reason why the United States of America, the wealthiest country in the history of the world, spending 14 percent—14 percent—of its gross national product on healthcare, cannot provide basic health insurance to everybody. And that’s what Jim’s talking about when he says everybody in, nobody out: a single-payer healthcare plan, universal healthcare plan. While outside the Democratic Party mainstream, Obama was able to win his 2004 U.S. senate race by stitching together a coalition of socialist/communist dominated unions and "community organisations". Obama has also received the backing of several independent Latino elected officials led by State Sen. Miguel del Valle, Rep. Cynthia Soto and Alderman Ray Colon. Alderman Joe Moore also backed Obama, as did USAction leader William McNary. At a North Side rally for Obama, Democratic Rep. Jan Schakowsky noted that these are extraordinary times that require a different kind of leadership in the fight against ultra-right policies. "We don't need any old Democrat. We don't need a go-along, get-along senator. It is amazing that it's the 21st century and there are no African Americans in the U.S. Senate." "Noting that Hull has thrown around his considerable fortune to gain endorsements of elected officials and Chicago war organizations, Schakowsky said the key to victory would be "voter identification and get-out-the-vote. People power beats money any day of the week"." Teamsters Local 705 - "the second largest in the country"
The Council for a Livable World, founded in 1962 by long-time socialist activist and alleged Soviet agent, Leo Szilard, is a non-profit advocacy organization that seeks to "reduce the danger of nuclear weapons and increase national security", primarily through supporting progressive, congressional candidates who support their policies. 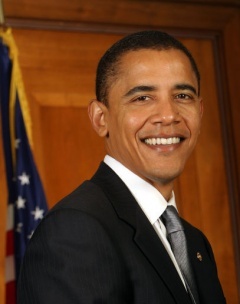 The Council supported Barack Obama in his successful Senate run as candidate for Illinois. While serving in the US Senate Barack Obama was a member of the Congressional Black Caucus.